Black Connecticutians are African Americans sampled in the state of Connecticut. Like other blacks in America, they usually also carry a high proportion of Caucasian or white ancestry and may also have American Indian. 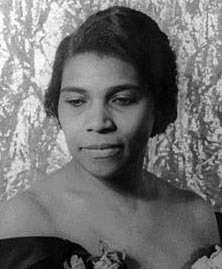 Marian Anderson was the first African-American to perform with the Metropolitan Opera in New York. Photo: Marian Anderson, who had a significant amount of Cherokee ancestry, was born in Philadelphia but settled on a Danbury, Connecticut farm with her husband after a long search to avoid racial discrimination. Credit: Carl Van Vechten. Source publication: Allele Frequencies for the CODIS Core STR Loci in Connecticut Populations, Scherczinger et.al, J Forensic Sci, 2000, July (4), 938-940.